Allen is working his calves today and Monday (mine are tomorrow) – it’s time for their second round of vaccinations and some fall calving cows need pregnancy checking. Weather is perfect except super windy. My job is to prepare lunch for the guys for whenever they arrive. It’s ready now (11:30), and i was notified that they’ll be in probably about 1p. Hopefully, all will go smoothly. It was a challenge to fill a plate with neatly peeled eggs. Although i set a couple dozen back, it was still not long enough for them to peel easily. In other words, they are too fresh! Home picked blackberries with fresh ground wheat berries for the batter. Yeah, and sugar, and honey, and butter, and milk, and baking powder, and cinnamon. Weaning calves later than i had planned, but weather always trumps the best laid plans. Despite there being a chance of rain, the temperatures are warm enough to take the chance to wean my 10-11 month old calves – about time, their mommas could use a rest before calving again as soon as the 15th of April. Single strand electrified polybraid and electric netting make that final push to the corral uneventful for one person on foot mustering in 160 adult animals and 100 calves. Fenceline weaning – cows are far side of panels quietly eating hay. Next day, they were ready to move out. Methinks they were tired of their big babies!! Calves on the hillside eating hay with mommas within sight – no worries. However, by morning, they’ll start missing her. The sounds of fenceline weaning the first night. My husband has weaned his calves these past two days as well. The weather is cooperating nicely. A Big Snow for Us! Okay, i know, in many parts of the world, including the United States, a foot of snow is hardly an event. But we haven’t had accumulation like this for at least a decade! I’m not a fan of snow, but soft, loose snow like this is useful for subsoil moisture and filling ponds. Thankfully, with managed grazing protocols in place, one can largely avoid having to get out into the weather and on the bad roads. Today’s event is continuing, but the temps hovering around 30 degrees. The snow ploughs have been doing the best they can to keep highways open. Mostly livestock have no problems grazing through this snow, though heavy cover of ice on top of a foot of snow is actually a really bad situation, which we haven’t had for many, many years. Below are some photos from years past since i’m not driving up to my farm today on slick roads just to take a photo of my cows. In a few days, i’ll mosey on up in my JD Gator and check on them. If they need more grazing, i’ll roll up the polywire and let them have access to the next paddock already set up. In the next paddock are 5 big hay bales they will have access to as well as mostly grazing. However, i don’t expect them to need a new break. Sheep bale grazing near a small patch of timber. Queen of the Log! Sheep and horses handle the snow very well, since they will just paw through to the goodies. This photo is not taken today, but illustrates how cows and calves alike have no problem grazing through deep snow. They are not expecting to be fed. The only livestock we have that refuses the snow are our small flock of laying hens! Happy hens when i fed them inside their eggmobile. Today’s (June 19) chores were frustrating and exhausting – hopefully, i won’t vent too much, but instead methodically record what happened and what decisions to make based on the mishaps. However, the first of the morning was spent walking in 3 Angus heifers to attach Estrotect patches in preparation for AI (artificial insemination) over the next weeks followed by spraying off 30 gallons of Surmount chemical mix on woody brush at my farm. Started about 5:30 am. This late spring I started letting my cows graze the new seeding implemented last fall. It’s been super, super dry (until today! already 8/10s of an inch and still gently raining), so using a back fence was not important since the grass wasn’t trying to grow back after grazing because of the heat and dry. Nevertheless, I’ve been stripping off sections of about 2 days grazing each – no where near what could be considered mob grazing, but i’ve already decided that is a practice which simply won’t work for me. I had already set up 2 temporary fences of polybraid of about 1/4 mile each. Anyone who has done this realizes that that 1/4 mile of walking turns into at least a mile by the time the poly is unrolled, then walk back to get posts, then set up posts along the poly and hook the handle into a hot (electrified) lead. When i arrived this morning, the cows had blasted through both of them!! I was not a happy camper to say the least. Thankfully, i had brought along another 1/4 mile roll of poly braid and I pushed the cows sort of back where they belong and i unrolled this tape. The grass and weeds were tall, so it just sort of laid on top and looked like a fence the cows didn’t want to bother. Testing the lead, i found that there was no electricity. Ah ha! all the polybraids were ‘dead’ and with baby calves running around, it didn’t take long for them to run through with mommas right behind. But why was the fence dead? I know this tree doesn’t look very big in this photo, but it was about 18 inches in diameter where you see here. But my spinning jenny was not hit and, although, the post was pushed over a bit, it was still strongly in place. I had spent some time at that very spot repairing some wire and gate just 24 hours before. Why did the tree not fall while i was there? Only by the grace of God. Not only that, but my spinning jenny was unharmed and the end post was still in place! Only one gate handle and the top hi-tensile wire was busted. Easily repaired that. Plus, the tree fell in such fashion that i didn’t even have to move it or cut it up. (thank goodness because i didn’t have my chainsaw on this trip). I simply repaired around it. It will have to be removed when i have time. The daisy wheel wire tightener was the go-to some 20 years ago and still is for many. There might be 2 or 3 of these left on my farm, along with a couple Hayes tighteners. When i redesigned and built my new paddock system, i used only Gripples. They are so easy to use, remove, splice, etc. Nevertheless, because of the extra wire stored on this tightener, i had enough to splice the broken line with a Gripple. I don’t carry the proper tool for Daisy wheel in my Gator, so had to pull this pin and unwind by hand, which was a bit of challenge, but not insurmountable. But this also is a prime illustration as to why forests, timbers, draws, need managing! Treehuggers take me to task for removing mature and junk trees. But without management, trees can become diseased, can’t compete for sunlight and nutrients so they can die and are a major hazard. Anyway, back to my morning winding up. Once all was said and done, i’d walked at least 5 miles in tall forage, scratched through dense brush, and crawled in and out of deep ditches to retrieve all my temporary fencing and posts, finishing the morning installing a new rain gauge, checking my replacement heifers, and resetting an end post. Dragging back to the seed plant, refueling the JD Gator and using forced air spraying out the seed heads from the grill (this must be done to keep the Gator from overheating), unloading the reels of polybraid and a bunch of posts. I forgot to take water with me and by noon (got home), i had lost 4.2 lbs. Goodness, that is 1/2 gallon of water sweated out! This was another reminder of why mob grazing with multiple shifts per day will not fit with my schedule and quality of lifestyle. It’s just too stinking much work – i sold off the sheep to get away from so much exhausting work. With tall grass (not complaining), deep ditches, long stretches of temporary fencing, dense brush, and baby calves not trained to electric braid, there are simply too many bugaboos to make this a happy time. The mob currently has about 20 acres to relax and graze. It is what it is – i do the best i can. Can’t believe i took this blurry photo and, worse, actually posting it here! But that is a medium sized Gripple which is used on hi-tensile electric fence. Easy on, easy off. Weather was nearly perfect this morning – a welcome relief from the 90 plus temps and high humidity. May have been the most beautiful day since last November! This is my viewshed whilst shifting cows to a new paddock. Okay, actually they shift themselves – i really don’t do much with the cows most of the year. Going along with my previous post, this article appeared in the 24 March issue of Midwest Marketer and tickled my ears. Check out this Bale Grazing Calculator! This primer on bale grazing is excellent, though dated. Since its publication, i think producers have found that plastic twine and netwrapping materials need to be removed before the livestock have access to the bales. Winter-feeding beef cattle on hay and pasture fields can minimize labor of hauling manure while still distributing crop nutrients. Many Beef cow-calf producers feed hay rations to cows in confinement settings during the winter months. Feeding hay on fields away from the barn is gaining popularity. Labor and machinery requirements of hauling manure can be minimized by winter-feeding beef cattle on fields. Care should be taken with feeding practices to ensure that crop nutrients are evenly distributed. Feeding on fields is typically accomplished by strategically spacing hay bales around the field either with or without hay rings frequently referred to as bale grazing. Another feeding method on fields includes unrolling bales on the ground. Unrolling bales on the ground typically allows for better crop nutrient distribution. Spacing bales across a field creates a situation of concentrated nutrients from manure and waste hay in the areas where bales are fed. 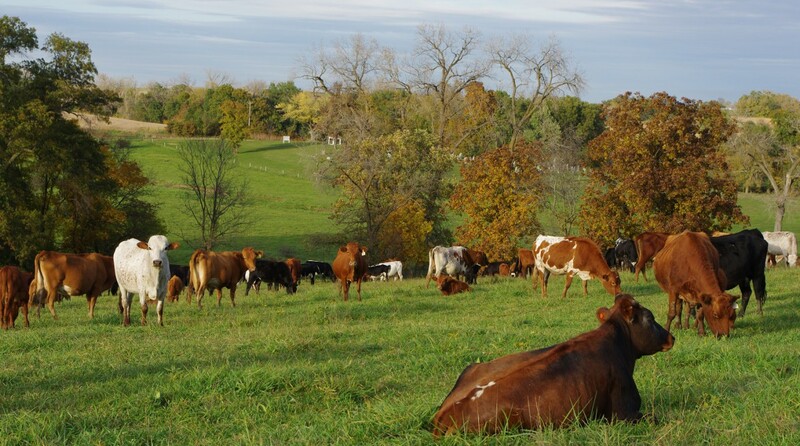 Over time, nutrient distribution can equalize with good grazing and management practices to promote soil health. Nutrients can be distributed by livestock and soil microbes over time, however, uniform nutrient spreading is more ideal for crop production yields. Utilizing the various feeding methods can result in a wide range of hay waste. Producers need to weigh cost savings associated with winter feeding on fields and feed loss with any given feeding method. Feeding on fields allows nearly 100 percent nutrient cycling into the soil for both phosphorous and potassium while nitrogen capture will be variable. Consequently, hay waste is not a 100 percent loss. Much of the crop nutrients from hay waste is available to the next growing crop. If hay is harvested on the farm, nutrients are simply redistributed to the feeding area. If hay is purchased, those nutrients are added into the farm nutrient pool. Dry feeds will usually contain 10-15 percent moisture or 85-90 percent dry matter. A 1000 lb. bale of dry hay with 15 percent moisture will contain 850 lb. of dry matter. Ensiled feeds will contain considerably more moisture. Protein contains 16 percent nitrogen. Crude protein is calculated by multiplying the percent nitrogen by a conversion multiplier of 6.25. From the example hay analysis, 10.6 percent crude protein can be multiplied by 0.16 or divided by 6.25 to equal a rounded off 1.7 percent nitrogen. The nitrogen content multiplied by the dry hay bale weight of 850 lb. equals 14.45 lb. of nitrogen in the bale of hay. The percent phosphorous (0.18 percent) and potassium (1.6 percent) are also multiplied by the 850 lb. of dry matter hay to equal 1.53 lb. of phosphorous and 13.6 lb. of potassium. Producers must be aware of the differences between feed analysis and fertilizer analysis. Feed analysis are recorded as percent crude protein, elemental phosphorous, and elemental potassium. Fertilizer analysis is recorded as percent elemental nitrogen, phosphate (P2O5), and potash (K2O). Using Upper Peninsula of Michigan fertilizer prices, nitrogen is valued at $0.47/lb. N, phosphate at $0.35/lb. of P2O5, and potash at $0.325/lb. K2O. Table 2. demonstrates the fertilizer value contained in a 1000 lb. bale of hay. Fifty percent of the nitrogen and 85 percent of the phosphate and potash are recycled through cattle back into the soil and is used for future plant growth. Some of the nutrients are lost to volatilization into the atmosphere and are retained in the animal. Referring back to the example, 50 percent of the 14.45 lb. of nitrogen contained in the hay gives 7.2 lb. of nitrogen into the soil for plant uptake. The 7.2 lb. is multiplied by $0.47/lb. to value the nitrogen at $3.38. Elemental phosphorous and potassium need to be converted to percent phosphate and potash. Elemental phosphorous 1.53 lb. is multiplied by a factor of 2.29 to equal 3.5 lb. of phosphate. Elemental potassium 13.6 lb. is multiplied by a factor of 1.2 to equal 16.3 lb. of potash. Eighty-five percent of both the phosphate and potash will be recycled into the soil for future plant uptake then multiplied by their respective unit price gives a value of $1.04 of phosphate and $2.65 of potash. The calculated fertilizer value of the 1000 lb. bale of hay is worth $7.07/bale or $14.14/ton. Current value of this quality of hay is roughly $80-100 per ton. In this example, about 15 percent of the value of average beef quality hay can be attributed to its fertilizer value. Farms that are marginal on soil nutrient levels may consider purchasing at least a portion of their feed to increase crop nutrients on the farm and replace some portion of purchased commercial fertilizer. Feeding hay on fields during the winter months has several advantages that beef producers can use to offset some of the production costs associated with beef production. For more information regarding the impact of feeding hay on pasture and hay fields, contact MSU Extension Educators Frank Wardynski, 906-884-4386 or wardynsk@anr.msu.edu or Jim Isleib, 906-387-2530 or isleibj@anr.msu.edu. To Hay or not to Hay? If, by purchasing hay, i can increase the number of employees (cows) which do not need health insurance, workman’s compensation, employee benefits, bonuses, etc and they seldom complain about the work (grazing and raising babies) they enjoy, and in so doing, also increase the soil quality by feeding microbes (making those employees happy as well), and would decrease my actual labor costs and time, wouldn’t this be a good thing? There are many qualified experts who discourage the hay habit – and i completely agree if i had to own and operate the very expensive equipment and time needed to bale hay, which would be on my own property, thereby simply moving nutrients from one point to another and not increasing – so, am i missing a very big point? BUT, soil quality is not increased (unless mob grazing is implemented), and certainly not as fast, Compared to renting more acres, fence and water maintenance does not increase. What is the right answer!!!!???? There is time for more reading, listening, studying, and sharpening the pencil. In the meantime, first week of April , calves will be weaned, then second vaccinations on weaned calves, by 25 April cows will begin calving for 45 days, soil sampling select paddocks, then i plan to implement UHGD (aka mob grazing). Winter grazing in north Missouri.